Will Vaus' newest book, The Hidden Story of Narnia: A Book-by-Book Guide to C. S. Lewis' Spiritual Themes, has just been released by Winged Lion Press! It is available now for order by visiting our store: www.willvaus.com/store. 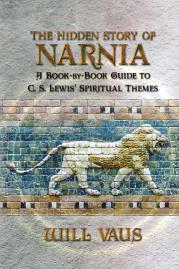 Since The Chronicles of Narnia were first written by C. S. Lewis in the late 1940's and early 1950's various schemes of thematic unity have been suggested for the books. Some have maintained that each of the books represent one of the seven Catholic sacraments. Others have put forward that each book acts as a commentary on one of the seven deadly sins, or one of the seven virtues. More recently it has been suggested that each of the seven Narnia chronicles corresponds to one of the seven planets of the medieval cosmos. But what did Lewis himself say about the overarching and unifying thematic structure of the Narnia books? That is what this book seeks to set out and explore: what C. S. Lewis called "the hidden story" of Narnia. "A thoughtful and thought-provoking book." "I am asked again and again by lovers of Narnia if there is a book out there that will help them understand the deeper Christian meanings of The Chronicles of Narnia. I am happy to say that that much desired book now exists. Will Vaus' The Hidden Story of Narnia offers a clear and concise analysis of the spiritual architecture that undergirds each of the Chronicles, and it does so in a language that should prove equally challenging and accessible to academics, non-academics, college and high school students, and even well-read children. Vaus makes clear all the links between Aslan and Christ and between the Narnia books and the Bible. But he goes far beyond this. He also links the themes of the Narnia books to the vast corpus of Lewis' other works so as to make clear the unity of Lewis' Christian worldview. He further challenges his readers to see and wrestle with the greater moral and ethical dimensions of the Chronicles, highlighting the nature of virtue and vice in a manner that would surely have gained Lewis' hearty approval. He concludes by laying down seven guidelines for living like a Narnian that are practical without being didactic and that will help his readers to carry the message of Narnia into their own lives." The Hidden Story of Narnia splendidly connects all seven of the Narnia books with not only their biblical correspondences but also with relevant passages from Lewis's other works, allowing readers to journey further up and further in with their understanding of and their appreciation for this great writer and thinker. In this book, noted C. S. Lewis scholar Will Vaus charts the points of spiritual intersection between the seven Chronicles of Narnia books and the Bible. The Hidden Story of Narnia maps a path into Narnia and back again into our world for those who wish to understand the spiritual ideas and allusions in Lewis' beloved Narnia tales. Suitable for group study as well as individual benefit. "As with his previous work on C. S. Lewis, Will Vaus provides clarity and informed perspective, taking us behind the scenes of the origins and meaning of Narnia. The teacher as well as the student of Narnia will find this a very useful volume." "What a delightful--and helpful--book! Readers of Lewis' Narnia books will enjoy splashing back into the stories and thinking about the enduring truths so freshly evoked by Lewis and highlighted by Will Vaus. Though rooted in solid scholarship and theology, The Hidden Story of Narnia is accessible to those new to both. It will take you back to The Chronicles of Narnia for another look--at the books, at yourself." "C. S. Lewis will continue to be read for a long, long time. He always attracts new readers longing for clear and illuminating introductions to his books, his ideas, and his wide world so integrated by his faith. Will Vaus has proved once again that he knows his subject and he knows how to give readers a more robust appreciation of Lewis. The Hidden Story of Narnia, with its clarity and engaging style, is another brilliant example of Vaus' skill as an expositor." For more information about the publisher click here: http://www.wingedlionpress.com/.